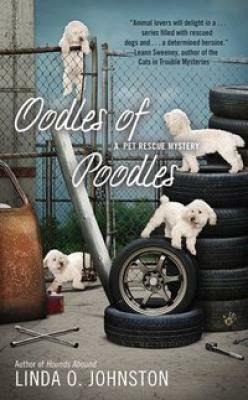 Shelter manager and pet rescuer Lauren Vancouver once again takes on the role of amateur sleuth when there’s a murder on a film set . . .
Has Hollywood gone to the dogs? Pet rescuer Lauren Vancouver is observing production on a new movie called Sheba’s Story. The title character—a white Miniature poodle—is played by many similar-looking poodles, and to make sure no animals are harmed, Lauren’s friend, veterinarian Carlie Stellan, and Grant, a handsome representative from the American Humane Association, are on location. But when the film’s director is killed in a suspicious hit-and-run after arguing with Carlie about animal safety, it’s up to Lauren to clear her friend’s name and catch a killer before someone else ends up in oodles of deadly trouble. Linda O. Johnston is a lawyer and a writer of mysteries, paranormal romance, and romantic suspense.